Jeff started in what was called multi level marketing back in 1978, so for almost 40 years now he has been a network marketing professional! An author, a world traveler and a philanthropist, Jeff has been supporting HIV orphanages, establishing schools for children in poor countries and instrumental in supplying meals to millions of hungry children around the world. His leadership is servant centered, and he lives that message daily in supporting his leaders around the world! Today Jeff has a distributor base of 500,000 in 56 countries that annually orders over $200 million dollars of product! What's interesting is, he began all that when he was broke, and he sold a junk truck for $200 dollars to get started! 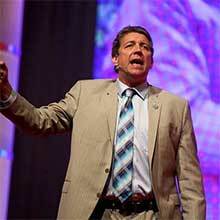 For years he's been a solid 8 figure earner and is listed in the top 70 worldwide income earners in Network Marketing! He's also a passionate song writer with three CDs on iTunes and lives in the Great Smoky Mountains in Tennessee with his wife Michelle and his two children.